Two Wearside men are facing lengthy driving bans and possible jail terms for their part in illegal drag racing. Police have labelled their antics like "a scene from the Fast and the Furious" car movie series. Race organiser Damian Rodgers starts one of the races. 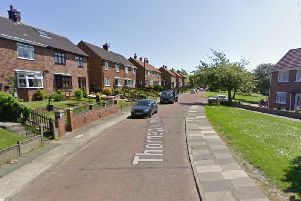 The gang of four included event organiser Damian Rodgers, 39, of Coach Road Estate, Usworth, Washington, and Robert Graham, 36, of Falmouth Road, Ford Estate, Sunderland. Dashboard camera footage caught their part in races watched by dozens of spectators on an industrial estate. The recordings show Rodgers starting races using a firecracker. Rodgers denied three charges of aiding and abetting dangerous driving at a four-day Newcastle Crown Court trial this week. He was found guilty by a jury of three counts of the lesser offence of aiding and abetting careless driving. Graham and Garry Kelly, 24, of West Terrace, Choppington, Northumberland, both denied dangerous driving and were found guilty on a lesser charge of careless driving. David Burdis, 28, of Bensham Crescent, Bensham, Gateshead, was found guilty of dangerous driving, driving without insurance, driving without a licence and driving while disqualified after denying the charges. All four will return to court to be sentenced at a later date.